Voters approved the marijuana legalization initiative I-502 in Washington state last November, and it is now legal to possess up to an ounce of marijuana, but a full-blown marijuana commerce industry doesn't just happen overnight. The state is still months away from having a functioning system of state-taxed and -regulated marijuana cultivators, processors, and retailers, but the process is well underway, and by most accounts, it is going relatively smoothly. 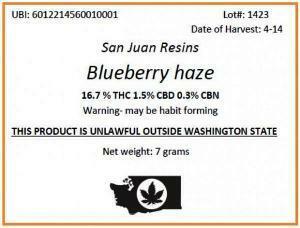 This is how your Washington state marijuana will be labelled, according to the Liquor Control Board. Last month, the Washington Liquor Control Board (LCB), the state agency charged with setting up the state's marijuana industry, issued its initial draft rules. It took written comments on the initial draft rules through Monday and will issue revised draft rules later this month. The LCB will hold public hearings on the rules for all three envisaged licenses -- grower, processor, and retailer -- in late July, promulgate final rules in August, begin accepting license applications in September, and begin issuing licenses in December. From then, it is still likely to be months before the first legal marijuana is sold in Washington because only once growers are licensed will legal marijuana destined for retail sale be in the pipeline. It takes a minimum of three months to bring an indoor crop to harvest. But by sometime next spring, consumers should be able to go to their local pot shop and make their selections. "These initial rules balance our goal of developing a tightly regulated system with reasonable access for small and large business models to participate within the system," said Board Chair Sharon Foster. "They are based upon hundreds of hours of internal research and deliberation, consultation with multiple industry experts and input from the over 3,000 individuals who attended our forums statewide." The initial draft rules reflect the Board's stated goal of developing a tightly regulated and controlled recreational marijuana market. Included in the rules are elements that address out-of-state diversion of product, traceability of product from start to sale, youth access and other public and consumer safety concerns. Application Window -- The application window would open for 30 days for all license types and be extended or reopened at the Board's discretion. This approach was similar to how Colorado opened its medical marijuana system. Background Checks -- License applicants and financiers would be required to submit a form attesting to their criminal history, provide fingerprints, and allow criminal background checks. Point System -- The WSLCB would employ a disqualifying criminal history point system similar to liquor. An exception would be allowed for two misdemeanor convictions of possession within three years. Producer Structures -- Producer operations would be allowed in both secure indoor grows or greenhouses. Traceability -- A robust and comprehensive traceability software system will trace product from start to sale. Violation Guidelines -- In addition to the $1,000 fine for certain violations established by I-502, the initial draft rules also include a strict tiered system of violation penalties over a three year period (similar to the current standard penalty guidelines for liquor). Security -- The rules direct strict on-site surveillance systems similar to Colorado's current system. Advertising Restrictions -- I-502 restricts advertising within 1,000 feet of schools, public parks, transit centers, arcades, and other areas where children are present. The draft rules further restrict advertising as they pertain to children. Behind the Counter Storage -- No open containers allowed. Package and Label Requirements -- Consumers will know contents and potency of products they purchase. Defined Serving Size -- Serving sizes equal 10 mg of THC. Products are limited to 100 mg. Lab Tested -- Uniform testing standards by independent accredited labs. With the release of the initial draft rules, the period for written comment opened up. One of the first analyses -- not a formal comment -- came from the Henry Wykowski law firm, a San Francisco marijuana law practice that recently opened a Seattle office. Drafted by Wykowski attorney Rachel Kurtz, a longtime player in the Seattle marijuana reform scene, the analysis shined a light on some of what could be described as the rules' downsides. "Hash will not be allowed for sale at the retail stores," the analysis noted. "According to the draft rules WAC 314-55-079, 'marijuana extracts,' such as, hash, hash oil, shatter, and wax can be infused in products sold in a marijuana retail store, but RCW 69.50.354 does not allow the sale of extracts that are not infused in products. A marijuana extract does not meet the definition of a marijuana-infused product per RCW 69.50.101." The Wykowski analysis also warned that "fingerprinting will be required and sent to the FBI for anyone with an interest in the business being licensed, including financiers." That means anyone seeking a marijuana license is potentially incriminating oneself to the federal government, which continues to consider marijuana an illegal substance, even in states that have legalized it. After Monday's deadline for comments passed, the LCB reported that while initial comments on the rules were relatively light, the agency received extensive written comment over the final weekend and throughout Monday from public and private organizations. "In keeping with our goal of an open and transparent process for drafting the rules, we’re going to take an additional two weeks to consider the last-minute input we’ve received," said LCB Director Rick Garza. "The Board was prepared to issue the rules on June 19. However, it's our responsibility to carefully review and consider the comments we received." Among those commenting were Washington NORML, the Washington Cannabis Association, Seattle City Attorney Pete Holmes, organizations with concerns about impacts on minorities, and organizations with concerns about prevention, treatment, and public health, both led by the ACLU of Washington, whose Alison Holcomb took a leave of absence to lead the I-502 campaign to victory. The comments revealed a variety of interests -- some conflicting -- and concerns from various stakeholders in the issue. The prevention, treatment, and public health groups called for tighter restrictions on packaging, labeling, and advertising, shorter hours for retail outlets, and getting rid of the logo that features a marijuana leaf centered over an outline of the state, while the minority groups called on the LCB to ensure that their communities did not become dumping grounds for marijuana retail outlets. "Initiative 502 was designed to achieve better health and safety outcomes for our families and communities than marijuana prohibition has," said Holcomb. "It was not intended to 'mint marijuana millionaires' who prioritize profits over public health. The goal is to improve upon our experiences with alcohol and tobacco, not repeat them." "We supported I-502 because we were very concerned about the disproportionate enforcement of marijuana possession on African-Americans and communities of color," said Jon Gould, deputy director of the Children's Alliance, which signed onto the public health comments. "Prohibition hasn't worked, and it has had damaging effects on children and families. We think regulation would be better." "The Board needs to remember that it is setting a standard for marijuana regulation," said University of Washington professor Roger Roffman, who also signed on to the public health comments. "We have a unique opportunity to create a system that discourages glamorization of marijuana use and encourages respect for the public's health and wellbeing. Let's not waste it." While the public health and minority communities were concerned with restraining the marijuana marketplace, other constituencies had other concerns. "Most of our constituents are small growers with a hundred plants or less. We argued that when it comes to growing, priority should be given to individuals who are willing to have a garden of 99 plants or less," said Kevin Oliver, executive director of Washington NORML. "Our constituency includes two separate US Attorney districts that have disparate levels of enforcement activity. If the US Attorney's Office in the Eastern District gets wind of any marijuana operations, they shut them down. They're discussing zoning for grows the size of a football field in Seattle, and good for them, but that won't fly in eastern Washington. If they ignore the little guy, that's going to cut out anybody in eastern Washington, that's why we want them to prioritize for small growers under 99 plants." The 99 plants number is based on federal mandatory minimum sentences that kick in at 100 plants, but is also based on the observation that federal prosecutors are unlikely to go after grows that small when there are bigger fish to fry -- and bigger punishments to hand out. "Our concerns were very similar to most everyone else who was frustrated with the board's definition of what can be sold at retail and it's not allowing extracts like hash oil," said Kurtz, who worked with the Washington Cannabis Association in crafting its comments. "Nobody is happy about that. There are a lot of business people who were counting on that for their business model. The whole purpose of the initiative was to get rid of a black market, but by not allowing that retail, a black market will remain. We might as well actually regulate because it's going to happen regardless, but they don't seem very keen to change," she said. "The draft regs also don't allow for outdoor grows, but I have some hope they will change that," Kurtz added . "They've heard back from a lot of people about the need for outdoor grows, including Seattle City Attorney Pete Holmes. Forcing everyone indoors increases energy consumption, and growing outdoors is less expensive." On the upside, the LCB seems to be crafting reasonable regulations for out of state visitors and for preventing diversion, although diversion probably won't be a big issue, Kurtz said. "This doesn't limit out of state people at all," Kurtz explained. "You can buy an ounce at a time, which is the limit of what you can legally possess." There is no integrated system to track purchasers, so out-of-staters could theoretically go from retail outlet to retail outlet, building their stashes an ounce at a time, but that doesn't mean there will be an issue with diversion to other states, Kurtz argued. "Economically, it just doesn't make sense," she said. "If someone from North Dakota wants to sell pot there, they could come here, but they would be paying full retail and having to go to a bunch of stores, and they wouldn't have much of a profit margin paying retail. Or they could just grow some in their basement in North Dakota." A larger issue is diversion from cultivation sites, but Kurtz argued that a combination of security and grower self-interest should limit that. "There is going to be a lot of recordkeeping, an electronic system where growers will have to input data daily," she said. "There are product quarantines, there are security cameras. But more importantly, people are preparing to invest a lot of money in this to have a legitimate business, not to divert pot to the black market. I've been meeting a lot of people who I don't think would risk their licenses to sell to the black market." Washington's legal, regulated marijuana commerce is still a work in progress, but stakeholders pronounced themselves generally satisfied with the process so far. "We are in completely new territory in terms of creating a legal marketplace and we're being very vigilant. It's too soon to tell whether this new environment is going to adequately protect youth and be an effective public health approach," said the Children Alliance's Gould. "This has been a good public process, with lots of transparency and broad engagement. They are doing a good job in terms of being open and transparent," he continued. "What is also really apparent is the enormous amount of competition this has created, with industries and individuals looking at this as an opportunity for profit. There are choices that need to be made, and we and others are speaking up, saying we need to choose public health and kids over profiteering. If the WSLCB creates an environment based on policies designed to make this more profitable, that could have a detrimental impact on children, youth, and the public health." "We're getting there," said Kurtz. "Eventually we will have a good system, but it may take a few years to figure itself out." And so marijuana begins the transition from illegal drug to legal commodity in Washington state. That is, if the federal government allows it to happen. So far, the federal government has given little indication it's going to do much of anything about it, but that could change. Stay tuned. It's looking good.. potentially better than Colorado (as far as molding the future of the movement and allowing it to propagate across the nation.) We shall see how it all turns out. The latest I read from Holder on the matter seemed to be a veiled indication that the federal response to I-502 and A-64 will depend on what the actual regulatory framework ends up looking like. So far, so good, because there hasn't been a word about stopping either initiative.. the experiment moves forward! No. Just because you're getting a license to do something doesn't mean you're going to do it. Also, even if you're going to do it, that doesn't signal an intention to do it in violation of federal law. As it is right now, someone (such as a pharmacist for a pharmacy) seeking a license to carry controlled substances must seek them from both state & federal authorities, and is in the same position as the above if the state license comes thru 1st. The applicant could anticipate eventually being granted a federal license under existing or future law, or even not needing one under future federal law. So there's no self-incrimination problem. Why does a criminal record have anything to do with growing or selling... Scarlet Letters are well and living. What Ms. Kurtz did should be called a summation, not an analysis. I would really like to see someone who is not a criminal lawyer really analyze the new rules and regulations and then explain them to us so that we can figure out what we need to do and fast. Anyone have any ideas on this?